Preprints (earlier versions) of this paper are available at http://preprints.jmir.org/preprint/7073, first published Nov 29, 2016. Background: Breast cancer is one of the leading contributors to preventable illness and death among women. Although mobile phone apps provide unprecedented opportunity to engage women along the cancer continuum, little is known about the availability, content, and usability of breast cancer mobile phone apps. Objective: This study analyzed the content and adherence to literate design standards of all breast cancer-related apps available on the App Store and Google Play, as well as the relationship between their content, user ratings, and price. Methods: Following identification and downloading of all available breast cancer mobile phone apps in October 2015, 101 apps were confirmed as focusing on breast cancer. Based on prior research, we adapted and applied a content analysis scheme that was specific to breast cancer apps, including their main purpose, relevance to the cancer care continuum, and adherence to usability standards outlined by the Institute of Medicine (IOM). Results: The most common aim of apps was educational (73/101, 72.3%), followed by behavior change (24/101, 23.9%), fundraising (20/101, 19.8%), and advocacy (14/101, 13.9%). On the cancer continuum, primary prevention (strategies to prevent cancer cells from occurring) was mentioned in almost one-third of the apps (30/101, 29.7%). Less than half of the apps (46/101, 45.5%) presented information about mammography and/or breast clinical exam, and 53 apps (52.5%) discussed breast self-exam (which is no longer recommended). Symptoms of cancer prediagnosis, such as a lump, were discussed in almost half of the apps (48/101, 47.5%) and a similar number of apps included information about genetic risk for breast cancer (47/101, 46.5%). Information about breast cancer diagnosis was included in 42 apps (41.58%) and 43 (42.6%) apps discussed treatment options. Survivorship issues were addressed in 17 (16.8%) apps. Only one (1.0%) app discussed hospice. Adherence to usability recommendations was low. The median composite score was 3 (mean 2.60, SD 1.20) of the six recommended usability items. With eight plain language items, the median of the composite health literacy score was 5 (mean 5.06, SD 2.00). Most apps did not use easy-to-understand words (44/101, 43.6%) and few (24/101, 23.8%) defined key terms. Conclusions: Current breast cancer apps provide important information about breast cancer, but the most common topic covered is breast self-examination, a non-evidence-based screening strategy. Apps that focus on evidence-based strategies on the cancer continuum are needed, with a notable pressing need for apps that would address survivorship and end of life. Finally, developers of breast cancer apps should adhere to IOM standards to meet the needs of diverse populations and reduce current disparities. More than 1,677,000 women worldwide are diagnosed with breast cancer and more than 522,000 die of it annually , making it the most commonly occurring cancer and the principal cause of death from cancer among women globally . Breast cancer constitutes a major contributor to preventable cancer burden [3,4], which refers to the morbidity and mortality that can be reduced by health behavior change, access, and utilization of screening and treatment services. Notably, most of the inequity in cancer health outcomes, including international and interethnic differences in breast cancer incidence and mortality, are attributed to preventable causes [5,6]. Although evidence-based comprehensive programs have documented successes in increasing breast cancer survival rates in high resources settings, much work is needed in increasing their reach, particularly among medically underserved populations in the United States and beyond . Mobile health technology, or mHealth, holds great potential in reducing disparities in cancer-related health outcomes. With nine of 10 Americans owning at least one cell phone, and a majority (63%) of these devices providing access to mobile Internet service , it has tremendous penetration. Unlike previous communication technologies , these devices are disproportionally used by members of low-resources communities, with minority users more likely to access the Internet exclusively from their mobile phone . Further, well-designed mHealth holds great potential in promoting health in low-resources communities in developing  and developed countries . In view of the international and national burden of breast cancer and the potential of mHealth in improving medical and public health practices , it is important to understand the use of breast cancer-related apps across the cancer care continuum. However, although half of cell phone users reported downloading apps in 2013 , little is known about these apps’ design, availability, and health-related use in general and in the context of breast cancer in particular. 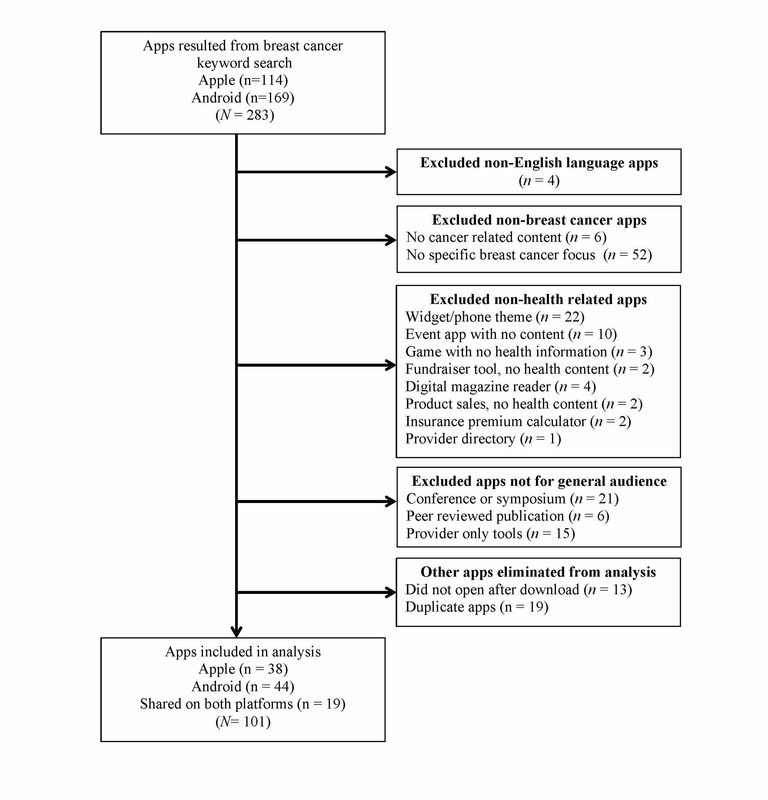 To date, studies have examined content of cancer-related apps using content analysis of apps’ descriptions on the App Store , of cancer-related apps available on iPhone only , and of studies reporting on educational cancer apps , yet the specific content of breast cancer-related apps available to consumers along the cancer care continuum  has not been examined. Studies of mHealth reveal that although apps offer beneficial functions , consumers are faced with a “bewildering array” of available health apps , with varied and often dubious quality [20,21]. Of apps that focus on cancer awareness, few discuss evidence-based preventive health behaviors , a deficiency that is likely because of a lack of medical professional involvement in design of apps . Furthermore, cancer-related apps can pose a danger; for instance, skin cancer-related apps accurately assessed melanoma only 10% of the time . To reach individuals from low-resources communities who are disproportionally affected by preventable cancer burden, literate principles should be followed in the design of apps. The Institute of Medicine (IOM) published guidelines on mHealth-literate design strategies, including plain language and appropriate usability features . However, it is unknown to what degree these standards are implemented in the design of breast cancer-related apps . 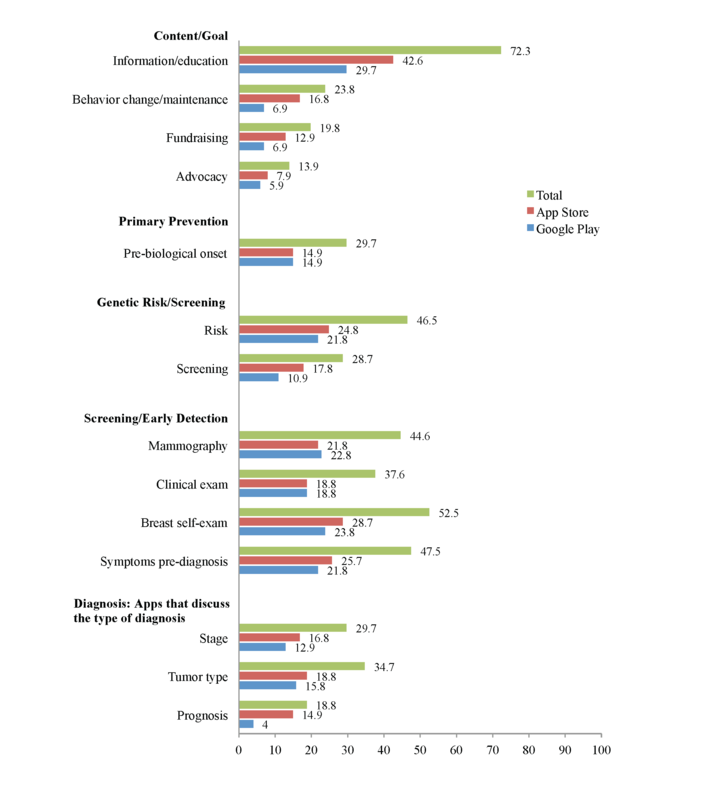 In view of the importance of breast cancer as a public health concern, the goal of this study was to systematically analyze the availability and content of breast cancer apps available on the main platforms of Google Play and the App Store, and their main features, including content on the cancer care continuum, goals, adherence to the IOM literacy guidelines, price, and user ratings. The following sections review past research on these factors as they relate to breast cancer mHealth. A growing body of evidence documents mHealth interventions’ effectiveness in engaging users in cancer preventive measures . For instance, text message reminders to female patients before scheduled breast cancer screenings were found to greatly increase screening attendance . Apps have also been shown to successfully increase breast cancer screenings in rural areas as well as disseminate important breast cancer information where cultural and social constraints prevent the spread of accurate breast health information [27,28]. Apps are also utilized to enhance care delivery during cancer treatment. These apps work as information management tools where patients can check appointments, journal symptoms, and log medications . These apps and devices can also reduce the communication gap between patients and providers, expedite treatment, allow patients to more easily report side effects of chemotherapy and other treatments to health care providers in a timely manner [10,30], provide information about postchemotherapy side effect management, and assist cancer patients with medication adherence . Although mHealth has great potential for cancer supportive care during treatment (eg, management of symptoms), research has not explored its role in improving patient quality of life [23,31]. Survivorship is another important area for mHealth cancer care interventions. In addition to cancer recurrence, breast cancer survivors are at a greater risk of comorbid conditions, such as obesity, osteoporosis, cardiovascular disease, and diabetes , and many breast cancer survivors do not meet healthy lifestyle recommendations . Several mHealth interventions on nutrition quality, physical activity, and improved eating self-efficacy have addressed this problem and were found to facilitate significant short-term weight loss, decrease waist circumference, and increase self-efficacy in breast cancer survivors . It has been suggested that lifestyle interventions for cancer survivors, including breast cancer survivors, should incorporate text messages and mobile phone apps to augment existing survivorship interventions . In addition, researchers noted the potential of apps to increase physical activity for breast cancer survivors  and the successful reduction of stress among breast cancer survivors in a technology-based self-management intervention  further demonstrates the promise of technology-based survivorship interventions. User skills are key to effective utilization of mHealth, particularly among underserved communities. Digital health literacy is related to one’s ability to seek, locate, comprehend, and assess health information from electronic sources . The concept of digital literacy draws on health literacy, defined as the ability to understand and use health information, communicate needs to health providers, and understand information from health care institutions . Health literacy is strongly related to health outcomes, including cancer communication . Similarly, digital health literacy is related to age and education, as well as to better outcomes as a result of health information seeking . Use of mobile technology is dependent on both health and digital literacy skills. Digital literacy is crucial to engage in health maintenance, change behavior, and utilize health care services . People with low literacy are less likely to access the Internet to seek information about health concerns , despite strong information needs following cancer diagnosis [42,43]. Patients with low health literacy are less likely to use health apps or perceive them as easy or useful, and hence are less likely to benefit from this technology . Understanding different literacy levels is consistent with research by Second-Level Digital Divide  that examined different skill levels of using digital communication technologies. Health-literate apps can bridge the digital divide by improving quality and usefulness of health information and interventions that would ultimately lead to better health outcomes . The price of apps is an additional factor in apps’ dissemination and adoption of health promotion messages. Paid diabetes apps demonstrated better adherence to IOM standards compared to free apps . Such advantage of paid apps has the potential to limit the dissemination of health information and to increase health disparities because most users are reluctant to pay for apps . However, it is unknown whether these differences are manifested in apps in other health-related content areas, including breast cancer. Finally, although systematic reviews aim at addressing availability and analyzing the content and features of the analyzed apps use , mHealth allows some insight into users’ experiences by featuring user ratings of apps. User ratings have been shown to be correlated with professional quality ratings of apps ; therefore, exploring their association with adherence to literate app design has the potential to shed light on the relationship between design and user experience. In view of the preceding research, the goal of this study is to evaluate the availability and content of existing breast cancer-related apps. In particular, we assessed apps’ content for intended purpose, consistency with the breast cancer care continuum, adherence to IOM plain language and usability standards, and the association between adherence to standards and apps’ prices and users’ reviews. The study did not involve recruitment of human population; therefore, ethics committee approval was not required. Following previous content analyses of mHealth apps [44,48], a list of breast cancer apps was generated in October 2015. Apple apps were searched directly from the App Store using an iPad device. Android apps were searched on Google Play Android App Store using an Android tablet device. The “any price” (Apple App Store) and “all price” (Google Play Android App Store) search options were selected to include both free and paid (fee-based) apps in the search results. The search term “breast cancer” on both platforms resulted in 264 unique apps (105 Apple apps, 131 Android apps) and 28 apps that were available on both platforms. Apps were chosen for analysis if they met the following inclusion criteria: (1) English-language app, (2) focused on breast cancer, (3) health related (as opposed to apps that included entertainment only, such as ringtones), and (4) intended for a general audience of consumers rather than health care professionals. A total of 163 apps were excluded (see Figure 1 for information on reasons for exclusion). One app had both a free and an upgraded paid version and the content was found to be different, so both versions were coded. The final sample of apps that were downloaded and coded in this analysis was 101, including 44 unique Android apps, 38 unique Apple apps, and 19 apps that were available on both platforms. Most of the apps were free (85/101, 84.1%) and only a minority (16/101, 14.8%) were paid apps. See Figure 1 for the process of inclusion and exclusions of apps. Figure 1. App Exclusion Chart. At the time of the study, only one prior study explored content of apps and adherence to IOM standards in diabetes-related apps . Consequently, no coding scheme was available for use in the context of breast cancer. This previous IOM-related coding scheme  was applied, and its content-related scheme was adapted to the breast cancer context based on past literature and in particular the focus of this study on the cancer continuum. TG created the initial adaptation based on the literature and her experience as a cancer communication researcher, and three additional authors provided input based on their knowledge and experience in cancer communication, including clinical experience of the last author. Following discussions between the researchers, the coding scheme was finalized (see Table 1 for the coding scheme). Two trained graduate research assistants downloaded each app to an iPad or an Android tablet. After reviewing the app’s features, they entered information into an electronic database. The coding process began with coding general characteristics listed in the App Store and Google Play. Then, coders coded cancer-related content and adherence to the IOM recommendations (see Table 1 for a list of variables) for designing health-literate mobile apps. The coders were trained by TG for two sessions lasting a total of 5 hours and then they coded the apps individually. Two independent coders coded a sample of 30 apps (29.7% of the total sample) to test intercoder reliability. Any coding disagreements were discussed collectively with the first author until agreement was reached. For each variable, intercoder reliability was assessed using Krippondorf alpha (see Table 1). a N/A: Krippendorff alpha could not be calculated due to lack of variance. Table 1. Variable categories, names, definitions, and intercoder reliabilities. Basic information was captured from the App Store and Google Play, such as the provider or seller, price (if any), age rating, app category, and numbers for both ratings and reviews for each coded app and its price. For perceived purpose of the app content, coders noted one or more of the following four categories: (1) information/education (eg, reference/glossary of breast cancer terms), (2) behavior change/maintenance (eg, becoming more physically active, participating in screening), (3) fundraising, and (4) advocacy (eg, awareness-raising campaigns). To examine the apps’ foci on the cancer care continuum, one or more of the following variables were coded: (1) primary prevention; (2) evidence-based cancer screening (mammography, clinical breast exam); (3) diagnosis, including information about cancer staging, type of tumor, and information about prognosis, such as survival rate; (4) disease management/therapeutics, including information about treatment, side effects of treatments, and treatment medications and chemo prevention to prevent recurrence; (5) survivorship; and (6) end-of-life care. In addition, the following prediagnosis categories were coded: (1) genetic risk (eg, family history of cancer) and (2) breast self-exam and symptoms of breast cancer prediagnosis. Finally, the coding scheme included research and scientific-related content, which was comprised of information on the biological process of cancer, references to research, and discussions of clinical trials. To assess the apps’ adherence to the IOM mHealth literacy guidelines , we used the coding scheme developed and tested by Caburnay and colleagues . Plain language variables included the presence or absence of the following: (1) common everyday words, (2) the pronoun “you” (second person voice), (3) use of present tense, (4) defined technical terms, (5) use of active voice, (6) use of action words, (7) use of short sentences (15-20 words), and (8) limited paragraph length (including bullet points and short lists). Each of these eight variables was coded (0=not present; 1=present), and the results were summed to create a composite plain language score. Usability was measured as a composite of (1) avoidance of dark backgrounds, (2) easy access to home page (eg, home/menu button), (3) clearly labeled back button, (4) in-app simple search, (5) enabled browsing, and (6) use of images that facilitate learning (eg, diagrams of breast anatomy). Each of these six variables was coded (0=not present; 1=present) and summed to create a composite usability score [24,44]. Variables on graphics and technology use were also recorded and were composed of integration with other device apps (email, calendar, maps, reminders, GPS) and save/print options. Interactivity variables included user-tailored/interactive content (eg, input contact information, measures such as weight and height, expert interactions, online peer support, connect user with event), use of audio and video features, and use of new media or texting (eg, Facebook, Twitter). We used SPSS version 23 (IBM Corp, Armonk, NY, USA) to calculate descriptive statistics; t tests to identify associations between app characteristics, price (free vs paid), and user ratings; and Pearson correlations to examine the relationship between IOM guidelines and user ratings. Significance was determined at a level of alpha=.05. Our goal in this study was to better understand availability and content of breast cancer-related apps available to the public, with a focus on their purpose, cancer continuum-related content, adherence to IOM literate design standards, price, and user ratings. The final sample of apps that met our selection criteria and was used in the final analysis (N=101) included 44 apps (43.7%) that were available on Google Play only, 28 (27.7%) apps that were available exclusively on the App Store, and 19 (18.8%) that were available on both platforms (see Table 2 and Figures 2-5). Most apps were free (85/101, 84.2%). Of the 16 (15.8%) paid apps, prices ranged from US $0.99 to US $4.99 with a mean of US $2.15. User ratings were provided for 49 apps; the median number of ratings per app was 6 (mean 25.16, SD 74.50), and the median star rating was 4.5 of 5 (mean 4.00, SD 1.27). In total, 40 of 101 apps (39.6%) were either rated for all ages or for ages 4 years or older. Another 19 (18.8%) were rated for 12 years and older, and 17 (16.8%) were rated for 17 years and older. The categories in which the apps were placed most often were health and fitness (24.8%, 25/101) and medical (31.7%, 32/101). Table 2. Characteristics of breast cancer-related apps on the App Store and Google Play (N=101). Figure 2. App characteristic percentages on App Store and Google Play: content/goal, primary prevention genetic risk/screening, screening/early detection, and diagnosis (N=101). Figure 3. 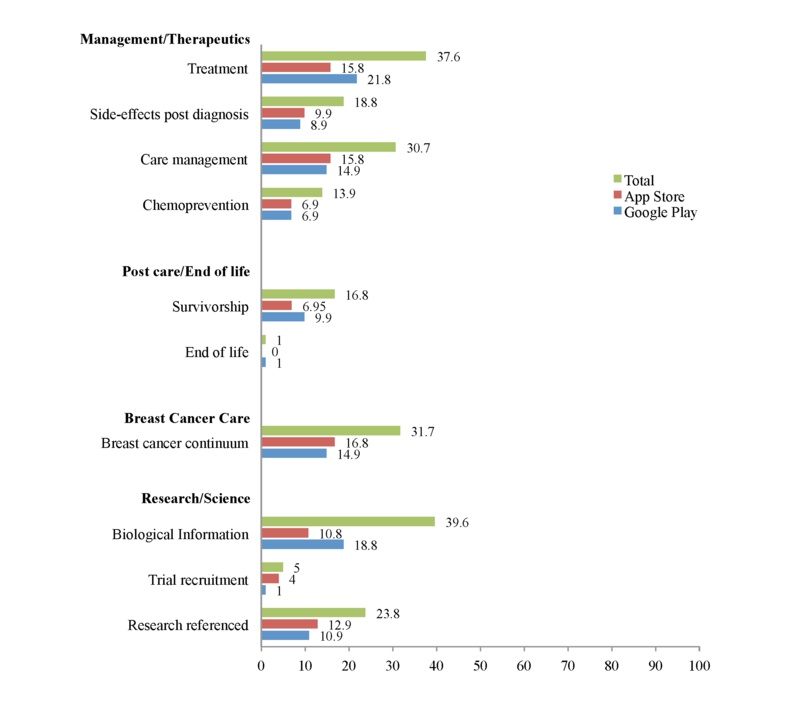 App characteristic percentages on App Store and Google Play: management/therapeutics, postcare/end of life, breast cancer care, and research/science (N=101). Figure 4. App characteristic percentages on App Store and Google Play: plain language and usability (N=101). Figure 5. App characteristic percentages on App Store and Google Play: technology, interactivity, and approach/theoretical underpinning (N=101). The analysis included the classification of the apps’ goals by four main categories, according to the messages they advanced: (1) aimed at providing information and education about breast cancer, (2) targeted behavior change related to breast cancer, (3) included messages about fundraising, and (4) aimed at breast cancer advocacy. Most of the apps contained information/education messages (73/101, 72.3%), approximately one-quarter (24/101, 23.9%) targeted behavior change, one-fifth (20/101, 19.8%) aimed at fundraising, and a one-sixth of the apps (14/101, 13.9%) were related to advocacy. More than half of the apps focused on only one of these categories (56/101, 55.4%), 26 (25.7%) on two categories, five (5%) included three categories, and two apps included all categories. Most apps that targeted behavior change also included informational/educational goals (18/101, 75%). Almost one-third of the apps (30/101, 29.7%) presented information about primary prevention of breast cancer, such as information about diet and exercise. Less than half of the apps in our sample (46/101, 45.5%) presented information about evidence-based methods of breast cancer screening (mammography and breast clinical exam). Of this subsample, 37 apps (80.4%) included information about both mammography and clinical breast exam. Eight apps contained information about breast mammography alone (17.39%), and only one contained information about clinical breast exams (2.17%). In all, 53 apps (52.5%) discussed breast self-exam. Additional prediagnosis variables included symptoms of cancer prediagnosis, such as a lump (48/101, 47.5%) and genetic risk for breast cancer (47/101, 46.5%). Information about breast cancer diagnosis was included in 42 apps (41.6%). Of these apps, 15 (36%) provided information about stages of breast cancer, prognosis, and types of breast cancer tumor together; 10 apps (24%) discussed stages of breast cancer and types of breast cancer tumors together; and two (5%) provided information about stages of cancer as well as prognosis. In addition, 11 (27%) provided information about types of breast cancer tumors only, three (7%) communicated information about stages of breast cancer only, and two (5%) addressed prognosis only. Of the 101 apps, 43 (42.6%) discussed various treatment options for breast cancer patients. Of these, 18 (17.8%) provided concurrent information on (1) different treatment options, (2) possible side effects of treatment, and (3) care management of breast cancer; eight (8%) discussed treatment options and side effects; and one (2%) provided information on different treatment options and care management of breast cancer together. Eleven (26%) apps provided information about different treatment options only, and five (12%) discussed care management only. Seventeen of 101 apps (16.8%) discussed issues related to survivorship, such as care coordination after completion of therapeutic treatment for cancer, financial burden of cancer, late and long-term effects of breast cancer diagnosis and treatment, or health promotion after a breast cancer diagnosis. Only one of 101 apps (1.0%) discussed end-of-life hospice. In all, 40 of 101 apps (39.6%) provided biological information about breast cancer, such as the mechanism of tumor development in the breast. Only 24 apps (23.8%) cited scientific research or evidence-based guidelines to support their information. Five apps (5.0%) discussed clinical trials. The median of the composite health literacy score was 5 (mean 5.06, SD 2.00), and only 13 (13%) apps had a composite plain language score of 8 of 8. A majority of the apps used present tense (84/101, 83.2%), active voice (78/101, 77.2%), short sentences (78/101, 77.2%), action words (75/101, 74.3%), short paragraph size (68/101, 67.3%), and personal pronouns such as “you” (60/101, 59.4%). However, fewer than half of the apps primarily used common and easy-to-understand words (44/101, 43.6%) and only 24 (23.8%) defined terms. The median composite usability composite score was 3 (mean 2.60, SD 1.20). None of the apps contained all six usability items recommended by the IOM. Five apps (5.0%) had a composite usability score of 5 of 6. The most common usability feature was the use of bold colors without dark backgrounds (89/101, 88.1%). 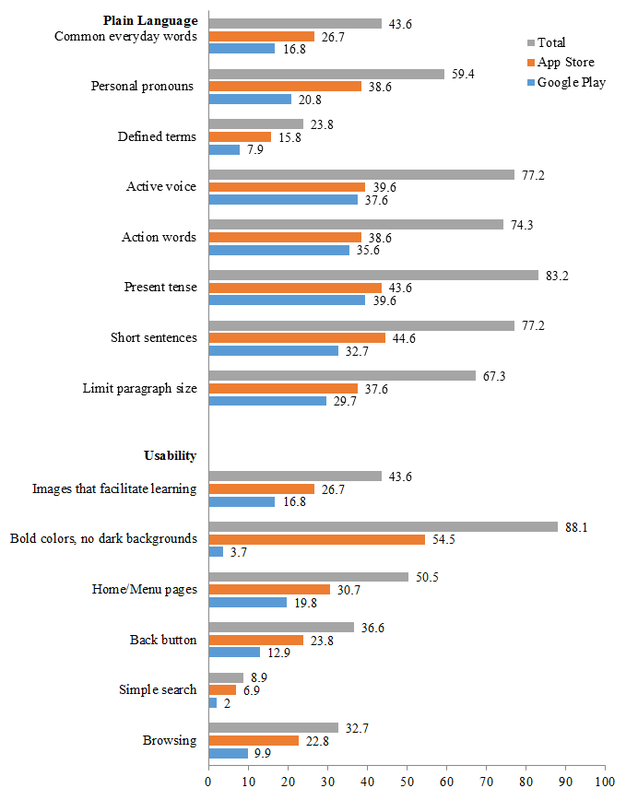 In all, 51 (50.5%) apps provided easy access to home/menu pages, 44 (43.6%) used images that facilitated learning, 37 (36.6%) had a back button, 33 (32.7%) were easy to browse, and nine (8.9%) had a simple search option available. The most common technological feature was the ability to share content via email through the app (32/101, 31.7%). In addition, eight (7.9%) apps had the option to save documents. Four apps (4.0%) connected users to maps or GPS and three (3.0%) provided users the option to print directly from the apps. Most apps (93/101, 92.1%) did not allow the user to customize information (ie, input weight, height, and other personal measures); only eight (7.9%) offered peer support and two (2.0%) provided an “ask the expert” option. There was no statistically significant difference in the composite plain language scores of apps that focused on information/education content (mean 5.10, SD 1.89) and apps that did not (mean 4.96, SD 2.41; t40.34=0.26, P=.80). Similarly, although the composite usability scores of apps containing information/education messages (mean 2.71, SD 1.12) were somewhat higher than other apps (mean 2.32, SD 1.25), these differences were not statistically significant (t99=1.52, P=.13) (see Table 3). Table 3. Adherence of apps to literate principles (N=101). Apps aimed at behavior change scored higher on use of plain language (mean 6.04, SD 1.85) than apps that did not aim at behavior change (mean 0.75, SD 2.00) and the relationship was statistically significant (t99=2.80, P=.006). Although these type of apps also ranked slightly higher in usability (mean 2.67, SD 1.05) than the apps that did not include behavior change messages (mean 2.58, SD 1.21), the difference was not significant (t99=0.30, P=.77) (see Table 3). The t test analysis also revealed that apps with a fundraising purpose had a higher composite plain language score (mean 6.40, SD 1.73) than those without a fundraising purpose (mean 4.73, SD 1.97) and the relationship was statistically significant (t99=3.47, P=.001). There was no significant difference in usability between apps that targeted fundraising (mean 2.55, SD 1.39) and those that did not (mean 2.62, SD 1.11; t99=–0.23, P=.82) (see Table 3). Apps that included advocacy for breast cancer causes scored higher for plain language (mean 6.14, SD 1.41) compared to those that did not advocate for breast cancer causes (mean 4.89, SD 2.07) and the relationship was statistically significant (t99=2.19, P=.03). In contrast, advocacy-related apps (mean 2.57, SD 0.94) and apps that did not include advocacy (mean 2.61, SD 1.20) did not differ in their usability (t99=–1.12, P=.91) (see Table 3). Of the 73 apps that had information/education content, 58 (79%) were free and 15 (21%) were paid. Most of the 24 apps that targeted behavior change were free (21/24, 88%), and three (13%) were paid. All 20 (100%) of the apps that aimed at fundraising were free. Of the 14 apps that that included breast cancer advocacy, 12 (86%) were free, and two (14%) were paid (see Table 3). Free apps (mean 5.13, SD 2.09) did not differ significantly from paid apps in use of plain language (mean 4.69, SD 1.70; t99=–0.80, P=.43). In contrast, paid apps scored higher on usability (mean 3.31, SD 0.87) than free apps (mean 2.47, SD 1.17). The difference was statistically significant (t99=2.73, P=.007) (see Table 3). Pearson correlations and t tests were used to examine the relationship between how well apps followed the IOM guidelines and how highly users rated those apps. Approximately half (49/101) of the apps in the sample were rated by users. There was a significant positive correlation between apps’ user ratings and their composite scores on the health literacy scale (r=.33, P=.02). Average ratings were significantly higher for apps that used action words (mean 4.26, SD 1.07) than for apps that did not (mean 3.42, SD 1.52; t47=–2.20, P=.03). Ratings were also higher for apps that used the present tense (mean 4.27, SD 1.03) than for those that did not (mean 3.08, SD 1.63; t12.39=–2.28, P=.04). There was no significant correlation between an app’s user rating and its composite usability score (r=.02, P=.85). This study examined the availability of breast cancer-related apps, their purpose, cancer continuum-related content, adherence to literate principles design, price, and user ratings. At the time of data collection, 101 apps focusing on breast cancer were available to the public. The majority of these apps were available on Android. The proportion of Apple-only apps in the sample represented their respective share of the cellular market of 28% at the time of data collection , albeit not the increased likelihood of iPhone users to download apps . This distribution of apps documented in this study demonstrates increasing efforts from developers to provide apps for both Android and iPhone platforms. Although apps often have multiple purposes, the majority are designed to provide information and education. Consistent with past studies , these findings reveal the limited potential of the current apps available to advance breast cancer-related behavior change. Research has shown that information is important yet insufficient in changing multifaceted health behaviors . The high number of apps that included information/educational content without clear guidelines for behavior change suggests limited utility of currently available apps in behavior change, despite the relative advantage of mHealth in providing interactive features that can support such change. Moreover, the content of most apps does not support evidence-based, comprehensive breast cancer-related behavior change in specific areas. These findings align with past research on cancer apps that identified few evidence-based preventive messages . For instance, although research and consequently clinical guidelines in North America in the past decade concluded that breast self-examination is an ineffective and often harmful screening strategy [52,53], this strategy was featured in more apps compared to the evidence-based strategies of mammography and clinical breast exams. Involving medical professionals in design of apps  may improve the quality of the information they provide. The findings also indicate that provision of information in support of treatment-related decision making emerges as an area of need. Less than half of the apps that provided information on treatment included information about possible side effects and of treatment options. This deficiency might be explained by the reluctance of developers to include medical information due to paucity of clinical expertise involvement in development of mHealth . However, extant literature documented the importance of such information for women with breast cancer , including availability of relatively easy-to-use decision tools . The analysis of the content of the apps on the cancer continuum reveals that, in contrast to primary breast cancer prevention, screening, and treatment, only a few apps focused on survivorship and only one included information about hospice care. No apps covered other aspects of end-of-life decisions and care. It is possible that information and support on end-of-life decisions and care are available on apps that are not breast cancer-specific (and consequently in apps that were not included in this sample), past research on cancer-related apps did not document such focus . Therefore, these findings lend support to the need for apps that would provide evidence-based information and support behavior change and decision making following breast cancer diagnosis, with extreme need for apps on end-of-life decisions and care. The analysis further underscores that greater adherence to literate design strategies continues to be a pressing need in breast cancer app development. Adherence to most usability design standards was low. It is possible that this low adherence relates to lack of experience or training of developers working on this relatively new platform. For instance, the literacy design principle that was most closely adhered to included use of colors, which is consistent with design of websites. In contrast, features that are arguably more significant in-app design, such as an easy browse and use of images, were not frequently included in the apps. Similarly, the findings underscore the importance of greater attention to using plain language principles in the design of breast cancer apps. Notably, of the plain language characteristics, text level was still too high in the vast majority of apps, which demonstrates that mHealth developers, like developers of print information  and of Web-based information , are not effective in bridging the literacy divide using principles such as defining concepts. Therefore, it is evident that the need for more appropriate plain language materials persists. However, behavioral change, advocacy, and fundraising apps demonstrated higher adherence to plain language principles. It is possible that these differences indicate greater degree of professionalism of these apps’ developers. Consistent with past studies that examined diabetes-related apps , paid apps were more likely than free apps to adhere to literacy guidelines. In this case, paid apps featured usability principles more frequently than free apps. As the vast majority of mobile phone users are reluctant to pay for apps , this finding also points at the potential for persistence of disparities between users who are able to use paid apps and those who are restricted to using only free apps. In addition, this study provides additional support to the potential of using reviewer ratings to learn about user experiences. In past research, user ratings were correlated with professional quality ratings of apps , but in this study they were correlated with apps’ adherence to plain language principles, thus lending further empirical support to the importance of plain language. To our knowledge, this is the first study to document such an association. In contrast, user ratings were not related to usability. Future studies should explore users’ expectations from apps’ usability in the context of breast cancer. This study contributes to research on the use of mHealth to advance breast cancer-related education and behavior change in a few ways. First, this is the first study to focus solely on breast cancer apps. In view of the unique information, education, treatment, and support needs before and following breast cancer diagnosis , this focus can advance understanding on the degree to which these apps have the potential to meet these needs. In addition, past studies that examined cancer apps were limited to analyzing only iPhone apps , apps’ descriptions in the App Store , or reviews of the literature reporting on cancer-related mHealth interventions . By analyzing relevant, working, uploaded apps available on both Android and iPhone platforms, this study provides a more comprehensive analysis of availability to consumers. Moreover, past studies did not examine design of cancer-related apps, including adherence to literacy design principles, and did not focus on breast cancer, whereas this study provides important insights on implementation of literate design strategies. As in any research project, the methodologies utilized in this study hold inherent limitations. Specifically, systematic content analyses are helpful in providing an overview on the content available to users and its adherence to scholarly and professional standards, but are limited in their ability to shed light on users’ experiences. Moreover, previous researchers noted that content analysis of mHealth cannot link user information to app use . In addition, information about the sources of the apps was not available; therefore, analysis of the relationship between app-related factors such as release dates, content source, organizational affiliation, or country of origin was not possible. Similarly, because we included only apps that focused on cancer, we did not examine other apps that might be used for cancer prevention purposes or that people might use to manage symptoms after diagnosis with cancer or survivorship and end of life. Finally, this study was conducted in the United States and, therefore, does not demonstrate availability of breast cancer-related apps in other markets or in languages other than English. Despite exciting potential for consumer engagement along the cancer continuum, availability of evidence-based breast cancer information and integration of literate design strategies to mHealth users is limited. This current state reveals that mHealth has not met its potential in engaging consumers with evidence-based information and design necessary to reduce preventable breast cancer burden and its associated disparities in health outcomes. Specifically, breast cancer-specific apps represent a limited spectrum on the cancer continuum. Therefore, this study is important in supporting the need for better-designed breast cancer apps that would adhere to evidence-based as well as to plain language and usability standards, with an extreme need for apps that focus on information necessary for medical decision making, most notably side effects, survivorship, and end of life. As a systematic review, the goal of this study was to provide an overview of availability of breast cancer apps and their adherence to evidence-based content and design principles. Such systematic analyses are time consuming and cannot be performed by users. Further, the characteristics of such users at this point are unknown and are likely very diverse, including cancer-free individuals, cancer patients, and cancer survivors, because different apps target women at different stages on the cancer continuum. Future studies should apply additional, user-centered research methods, including surveys and community-based studies to learn about users’ experiences using apps along the breast cancer continuum. Research reported in this publication was supported by grant # IRG-14-187-19 from the American Cancer Society. This research was also supported in part by the following: Washington University Center for Diabetes Translation Research, supported under the National Institute of Diabetes and Digestive and Kidney Disorders, P30DK092950 and National Cancer Institutes of the National Institutes of Health under award number R25CA171994. The content is solely the responsibility of the authors and does not necessarily represent the official views of the National Institutes of Health. Mechael PN. The case for mHealth in developing countries. innovations 2009;4(1):103-118. Spradley JP, McCurdy DW. Anthropology: The Cultural Perspective. Hoboken, NJ: John Wiley & Sons; 1980. Spradley JP. Participant Observation. Long Grove, IL: Waveland Press; 2016. Heaton J. Reworking Qualitative Data. Thousand Oaks, CA: SAGE Publications; 2004. Zhong N. Google play is not a long tail market: an empirical analysis of app adoption on the Google play app market. In: Proceedings of the 28th Annual ACM Symposium on Applied Computing. 2013 Presented at: SAC '13 28th Annual ACM Symposium on Applied Computing; Mar 18-22, 2013; Coimbra, Portugal p. 499-504. ©Tamar Ginossar, Sayyed Fawad Ali Shah, Andrew J West, Joshua M Bentley, Charlene A Caburnay, Matthew W Kreuter, Anita Y Kinney. Originally published in JMIR Mhealth and Uhealth (http://mhealth.jmir.org), 13.03.2017.